Northgate Cottage01263 715779work01603 870304fax Self-cateringA romantic cottage for two located in a popular west Norfolk village with an award winning pub within walking distance. Full of character and with lovely views from the bedroom and dressing room on the first floor, Northgate oozes charm and the owners have included many luxe touches for you to enjoy your stay, including a champagne welcome on week bookings. The village is just a few miles inland from the stunning Royal Norfolk coast, which is a designated Area of Outstanding Natural Beauty. Discover wildlife, spectacular and sandy beaches, gorgeous coastal villages, golf, sailing, great walking and birdwatching country and so much more. This region also hosts numerous quality restaurants and farm shops showcasing Norfolk's great food heritage. Come and visit this region at any time of the year for a warm welcome under big blue skies. • General: Underfloor heating in the kitchen and bathroom. Woodburner. Night storage heaters. • Standard: Kettle, Toaster, Hairdryer, Radio. • Rooms: 1 Bedroom, Dressing Room, 1 Bathroom, Sitting Room. Kitchen with Dining Area. • Other: Books, games and towels provided. Welcome tray. 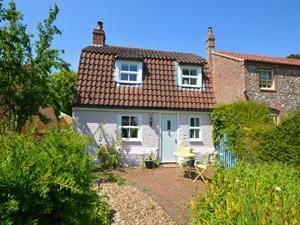 A romantic cottage for two located in a popular west Norfolk village with an award winning pub within walking distance. Full of character and with lovely views from the bedroom and dressing room on the first floor, Northgate oozes charm and the owners have included many luxe touches for you to enjoy your stay, including a champagne welcome on week bookings. The village is just a few miles inland from the stunning Royal Norfolk coast, which is a designated Area of Outstanding Natural Beauty. Discover wildlife, spectacular and sandy beaches, gorgeous coastal villages, golf, sailing, great walking and birdwatching country and so much more. This region also hosts numerous quality restaurants and farm shops showcasing Norfolk's great food heritage. Come and visit this region at any time of the year for a warm welcome under big blue skies.